SEATTLE -- The U.S. Bureau of Reclamation on Thursday agreed to obtain a pollution permit to settle allegations that operations at the Grand Coulee Dam in eastern Washington polluted the Columbia River in violation of federal clean-water laws. Under the settlement filed in U.S. District Court in Spokane, the federal agency said it would, for the first time, obtain a permit for discharges at the Grand Coulee Dam, the nation's largest hydropower producer. It also agreed to investigate the use of more environmentally friendly oils and to disclose the amount of oil, greases and other pollutants used at the dam that could possibly be released into local waters. The settlement resolves a 2016 lawsuit by the nonprofit Columbia Riverkeeper, which alleged the federal agency released oil and other pollutants from the dam into the river without a required permit designed to monitor and control water pollution. "The settlement will result in less oil discharged into the river. Oil is toxic. It harms fish and wildlife and it harms people who rely on that fish and wildlife," the group's executive director Brett VandenHeuvel said. He said it ensures the federal government does its part to keep toxic pollution out of the Columbia River. The Bureau of Reclamation, which operates 53 hydroelectric power plants in the country, did not admit to any wrongdoing, misconduct or liability in the settlement. A message left with a spokesman was not immediately returned. 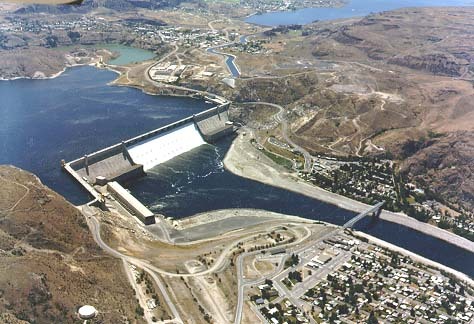 The Grand Coulee Dam, about 90 miles west of Spokane, provides enough electricity to power 2.3 million households in 11 states and Canada a year. The settlement mirrors one that the environmental group reached with the U.S. Army Corps of Engineers in 2014. The group similarly sued the Corps for releasing -- without a pollution permit -- oils, cooling water and other pollutants from eight dams on the Columbia and Snake rivers in Oregon and Washington. "Now that two large federal dam operators have agreed to limit toxic pollution and assess switching to eco-friendly oils, we think that will carry over to many other federal and private dam operators," VandenHeuvel said.